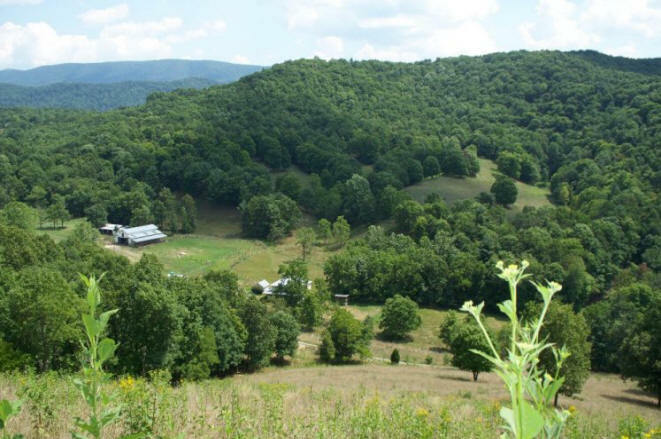 We are located in the Springfield District of Monroe county, amidst the rolling hills and tall ridges of the Allegheny Mountains. 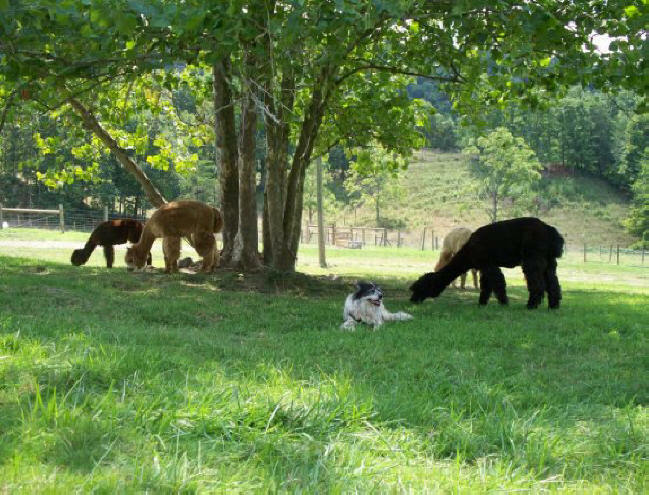 Four perfect seasons in this moderate climate allow our alpacas to thrive in comfort. We have a small, select foundation herd of happy healthy ARI registered huacayas . Our special animals carry the legacy of elite bloodlines that have been carefully bred for beauty and value, and we love every one of them. 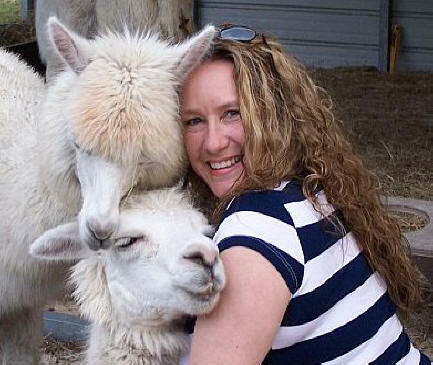 My husband Allen and I are now well in to our 12th year in the alpaca business, if you don't count the first year or so of research and "extreme investigation". Like many of you, whether you've taken those first steps already and started on your adventure or you are just beginning to investigate the lifestyle, we longed for way out of the hectic lives that we had found ourselves living. We also knew as anyone striving to live the country dream we would need a way to make a living in a rural environment. After ruling out many other kinds of traditional businesses alpaca ranching kept intriguing us. We had both already owned several businesses in our lives and a few considered quite financially successful by societies' standards. Success took on a new meaning for us, we didn't want to go back down the path of managing employees and high pressured sales and marketing. We take a low-key approach to owning and breeding these gentle animals. As Double "A Ranch, LLC we do everything possible to make sure that the clients we take on have the same passions; not just for the animals but for the continuation and heritage of a profitable business yet relaxed rural lifestyle. We are not big on the idea of trekking round the country with a trailer full of frightened animals attending shows and entering competitions just so that we can accumulate ribbons and awards. This is usually stressful for the animals, especially in the first and last trimesters of their pregnancies. Many ribbons such as fiber contests can be entered by mail without having to transfer the alpaca, make sure you have learned how to take proper samples and have any "show" blankets sheared properly from the animal on shearing day. Our preference is to spend our time with our animals in their pastures and barns; watching them, learning from them, and seeing that they are as comfortable and contented as we can make them. 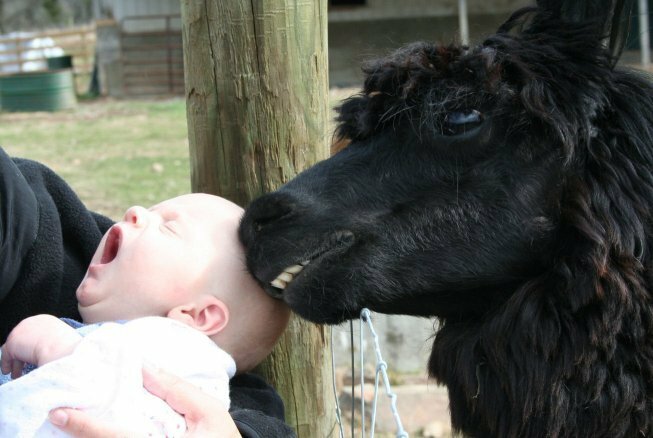 In this way, we try to ensure that alpacas we breed or broker grow to be socialized, healthy, and happy. Everyday our commute is a walk to the barn, we consider ourselves truly blessed. We hope to be able to help you realize this incredible lifestyle and enjoy these special animals as we do.